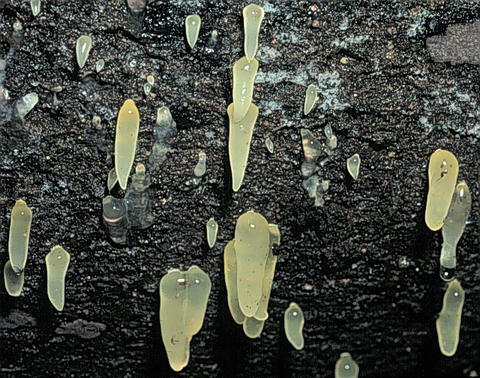 Basidiomata are up to 1 cm long and pendant from the side of a downed tree. The collection illustrated was found in the southern Talamancas near Parque la Amistad. The delicate, mucoid to gelatinous consistency makes the fungus difficult to collect and dry (preservation in a liquid fixative might be superior to dessication). The genus was described by R. H. Petersen (Mycologia 72: 301-311. 1980) to replace Myxomycidium which became a synonym of Mucronella. A key to species (as Myxomycidium) was published by Kobayasi (J. Jap. Bot. 38: 363-367. 1963).